My Daily Art Display blog today incorporates the two things I enjoy most in art; landscape paintings and discovering a painter I had, up till now, never heard of. 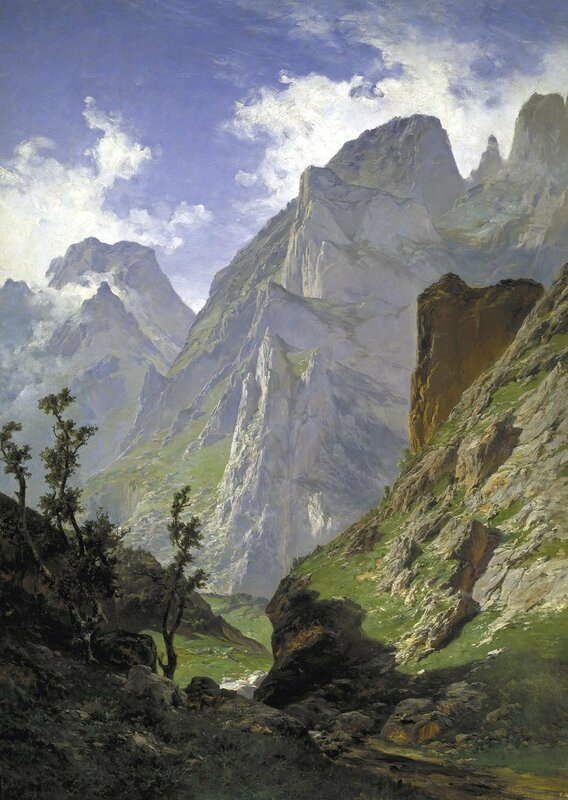 Today I am featuring the nineteenth century Belgian born Spanish landscape painter Carlos de Haes. Carlos de Haes was born in Brussels in January 1826. He was born into a dynasty of merchants and financiers and was the eldest of seven children. When he was nine years old his family moved to Malaga where he grew up and went to school. His initial artistic training was under the tutelage of Luis de la Cruz y Ríos, the Spanish miniaturist painter, who had once been the court painter of King Ferdinand VII. In 1850, at the age of twenty-four, he returned to Belgium and studied for five years under the Belgian landscape painter Joseph Quineaux. It was the influence of Quineaux which drew de Haes into the world of landscape painting and sketching and painting en plein air. During his five year stay in Brussels he managed to travel to France, Holland and Germany constantly sketching the varied landscapes he came across. It was also around this time that he became interested in the works of the contemporary Realist artists. In 1855 after completing his art course he returned to Spain and went to live in Madrid and became a naturalised Spaniard. In 1856 he put forward a number of his landscape works for exhibition in Madrid’s Exposición Nacional, where they were very well received. The following year, 1857, at the age of thirty-one, Carlos de Haes won the competition for the chair of landscape painting at theReal Academia de Bellas Artes de San Fernando (Royal Academyof Fine Arts of San Fernando), with his work entitled Royal Palace from the Casa de Campo. The Academy was an establishment which would half a century later be home to the likes of Dalí and Picasso. In 1861 de Haes was made Académico de mérito. During his tenure at the Academy, de Haes set about putting together a set of regulations for his students governing landscape painting and rules for future landscape competitions. He was insistent that his students mastered the art of en plein air sketching and painting instead of just producing historical landscapes which they had conjured up in the studio. This, he believed prevented the true study of nature, and he asserted that the en plein air aspect was of paramount importance when contemplating a landscape work. Haes encouraged his students to interpret nature directly and by working out in the open he insisted that they understood how the changing light changed how they viewed the vegetation and the terrain. He did however countenance using the studio to fine tune the painting and make final adjustments. Haes’ insistence that his students should produce a truthful depiction of the landscape, captured by painting en plein air, points towards his interest in the new Realism form of art, which claimed that artists should represent the world as it was, even if it meant breaking artistic and social conventions. During the next ten years Haes spent most of his time painting landscapes which featured the Spanish Pyrenees and the Guadarama mountains in central Spain. One of his students who accompanied him on his sketching journeys was Aureliano Berruete who would become one of the foremost Spanish painters. Carlos de Haes became ill in 1890 and died in Madrid in 1898. He bequeathed his mostly small-format paintings to his pupils, who gave them to Spanish museums, the majority of which are now housed in the Casón del Buen Retiro, part of the Prado Museum in Madrid. My featured painting today by Carlos de Haes was one which I saw when I recently visited the Prado in Madrid. It was completed by him in 1876, although the preparatory sketch for the work was dated in situ in 1874. It was exhibited at that the 1876 National Exhibition in Madrid and was subsequently purchased by the Spanish state. Carlos de Haes had been travelling with Aureliano Berruete around the wild and rugged Cantabrian rural area of Liébana when they came across this spectacular view. The oil on canvas painting, measuring 168cms x 123cms is entitled The Mancorbo Canal in the Picos de Europe. The Picos de Europa is a range of mountains 20 km inland from the northern coast of Spain and this landscape painting by de Haes depicts the awesome and craggy vista of the mountain range which was one of Carlos de Haes’ favourite type of spectacular and breathtaking views. At the bottom of the painting, although it somewhat difficult to pick them out, there are three cows and their herder. I stood before this beautiful painting and was awestruck by its beauty and its realistic quality. So, if you ever make it to the Prado be sure to find this work.